Abobe introduced an iPhone app for the photoshop.com, that allows users to edit their photos on iPhone. The iPhone app called Photoshop.com Mobile for iPhone is available for free to users, can be downloaded from iTunes. The Photoshop app allows users to do some basic editing of their photos like cropping, image rotation, and also allows to apply effects to the pics. 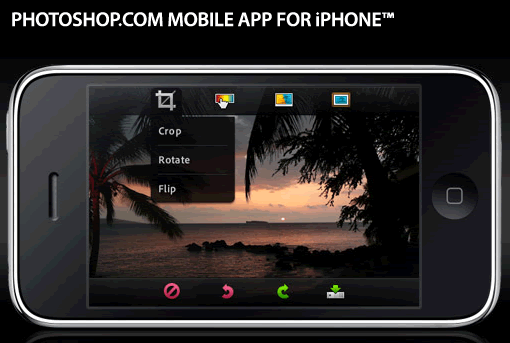 The applicationâ€™s integration with Photoshop.com site allows users to share the photos with friends, back them up to photoshop.com for saving space on iPhone. Photoshop.com has a 2GB limit, other than that this is great application for iPhone users to have for editing photos with few taps on the screen.